Yesterday I went to the London Comic Con at Earls Court, a science fiction, horror and comics fan convention. 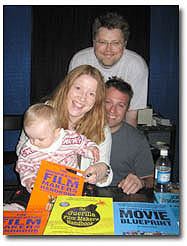 It was filled with stalls selling film and comic memorabilia and there were also stalls where you get movie stars (and some folk who are little more than extras) to sign their autographs for £20 a pop – what business, sign you name for cash! I went to Comic Com to get some 1950’s classic movie posters for my new flat, and bumped into several Associate Producers from Gone Fishing – I am delighted that I am, not the only geek involved in Gone Fishing! What caught my eye though, was a large stand from Universal Pictures. They were running trailers for a bunch of their movies coming out in the next year or so. They were asking people to sit down and watch these trailers, fill out a form rating each one, and in return, they would be entered into a draw for an iPod. Of course we have all heard of testing movies, but I have never seen audiences being tested on trailers. I managed to pinch a copy of one of the forms and you can take a look at it here if you are interested. 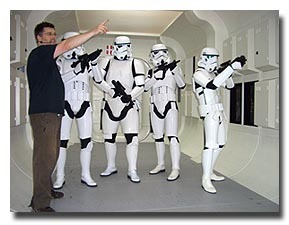 Basically, you can see that they are breaking the group down into a basic – have you been to comic-con before or not (or you or are you not a major geek? ), what age are you (age demographics), did you like the trailer? (how effective was the trailer), and will you go see the movie? All fascinating stuff, especially to see that even a player as big as Universal, values such grass roots data. What was most interesting though was just how eager people were to give up 20 minutes of their day, to fill out a form and win an ipod – or perhaps the idea of being somehow involved in the way a film is released was just too exciting to turn down. We were, after all, at ComicCon! 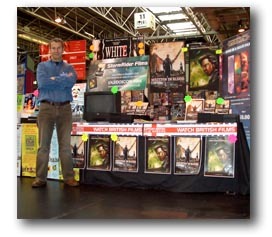 I spent the weekend with my good friend Simon Cox, at a science fiction convention in Birmingham called Memorabilia, selling my books and his movie on DVD, ‘Written In Blood’, signed by him of course. It was an intense two days, but very rewarding, not least because I sold some books, but also because I was forced to sell DVD’s - and this is something every film maker should have to do. All to often we sit in our ivory towers, imagining how wonderful our movie will be, what the poster will look like, how the audiences will flock to it - and that dream is almost entirely based one WHAT WE LIKE, and not what the market wants or the audience finds attractive. Simon and I were closing deals based entirely on… how we presented ourselves and our sales patter, the title of the film, the genre, the key art / poster, and the cast. Here are a sample of the common questions… ‘What’s is about?’, ‘so you are the director?’, ‘is it any good?’ Some of the comments were, ‘I like the poster’, ‘I like horror movies’, ‘you have a lot of energy for your movie…’ When it resulted in a sale, it was most often based on the buyer feeling the movie would be at worst OK, hopefully, terrific, but mostly on Simon and his enthusiasm. This is a fundamental principle in persuasion. I like you so I will buy your DVD (enhanced by him signing it). I don’t like the artwork for Simon’s film, but the audience out there sure as hell did. And that’s what matters. What this has taught me is that knowing your audience is the key to success - the genre, the cast, the title, the expectation, how to get to them above and beyond the obvious machines like Blockbuster and Amazon. Simon isn’t there to sell every DVD, it needs to sell itself. And hoping that will happen isn’t enough. So go and rethink your movie now. Can you see the poster? Can you see the trailer? Would you sell the DVD yourself if that meant the difference between success and failure? Consider, Jake West’s movie ‘Evil Aliens’, sold 35,000 units. There is a film maker who knows his audience.